Hertfordshire police say the latest knife amnesty has resulted in a record number of items being surrendered across the county. The haul includes swords, military knives, knuckle dusters, and a large number of kitchen knives. The amnesty, which ran from 11 to 17 March was part of Operation Sceptre, a national campaign aimed at reducing the number of illegal knives in circulation. Hertfordshire’s Police and Crime Commissioner, David Lloyd, said the amnesty sends our a clear message. 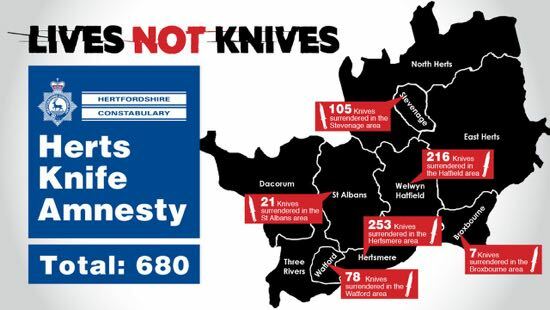 “These amnesties are an integral part of Hertfordshire’s Serious Violence Strategy to reduce the number of knives on the streets, but also to send the message out that carrying a knife won’t keep you safe.